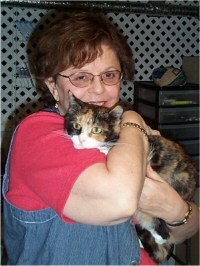 MONA WAS ADOPTED OCTOBER 12, 2003! 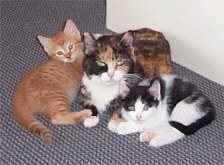 Mona has become Allegra Dolce ( fast and sweet) as a sister to Piccolo Forte ( little and loud), the dog. She has become queen of the house and put on a bit of weight because she likes to eat. Not fat, mind you, just about half a pound more or so. She has a window seat and multiple beds around the house. She hates the dog and just steers clear. Very affectionate - always kissing me, hugging, rubbing noses. I just love her so much and my husband does, too. I knew we were soulmates somehow, and it is true. We are going away for a week tomorrow, and she is staying at kittie/doggie camp where we always take Piccolo. I so hope she will not be lonely, because after being with us since October 10, she knows this is her home. Pictures later! 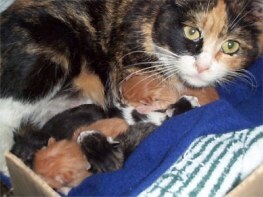 Mona was rescued from the frigid outdoors where she had been dumped with a newborn litter of kittens. 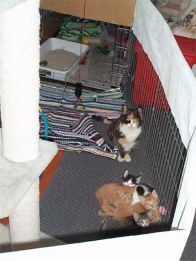 The kittens all found homes a long time ago but Mona remains behind, her only crime being that she is not a little kitten herself. Mona is a very affectionate cat. She welcomes human attention, purring and rubbing with gratitude. Mona gets along with dogs, on her terms. She will explain to them exactly what her terms are and once she is confident they comprehend, she has no problem living with them. Don't worry, we have never seen her lay a paw on a dog. She provides verbal instructions through a baby gate. Once she is confident the dogs get it, she roams freely in "dog territory" completely undisturbed by multiple dogs. After an introduction period, Mona gets along with other cats but she keeps to herself so she would not have a problem being an only cat. There is one scratching post in particular that Mona really loves so it will be going to her new home with her. Mona is about 2 years old. 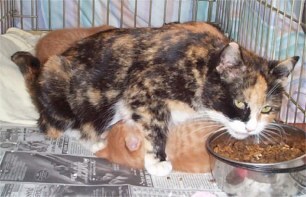 On February 27, 2003, upon entering a vacant garage for the daily feeding of ferals, one of our volunteers happened upon a cat she had never seen there before. She was not part of the colony and she was not feral. This was a very friendly cat. 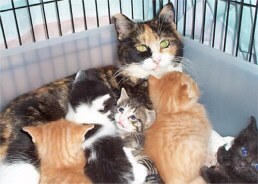 This was a very friendly cat with a litter of newborn kittens! 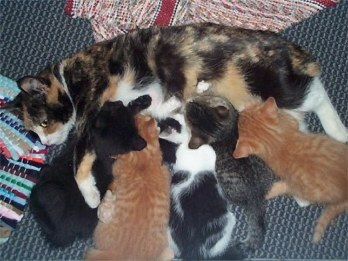 Obviously, this cat had been dumped while pregnant. It was 32 degrees outside and that had been one of the warmer days. 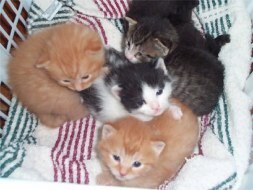 One of the kittens had already died. 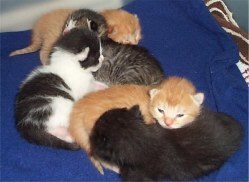 There were 5 left, a gray tiger, a solid black, a black and white and two orange tigers. 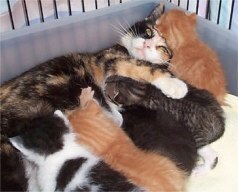 Mona and babies were packed up and brought to a foster home. Mona was very dirty and still had afterbirth on her. 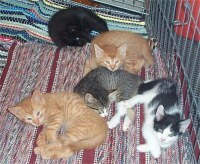 The kittens were placed on a heating pad while Mona got a good scrubbing and blow dry. It was very scary for her but she trusted us behaved very nicely. She complied with everything we needed to do including nail trimming and ear cleaning. 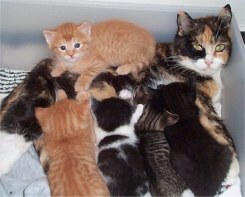 The family is now happy, safe and warm and the kittens will grow up friendly instead of feral, as they would have, had they been able to grow up at all out in the cold winter. Four weeks old: They are starting to explore the food bowl, water bowl and litter box but haven't quite figured out that it is food that goes in the mouth, not kitty litter! On March 27, at exactly 1 month old, Maali was the first to lap water and Miranda was the first to use the litter box for the purpose for which it was intended! 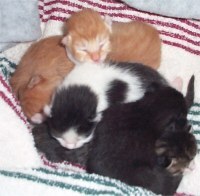 Five weeks old: The kittens are now lapping formula and eating dry and canned food. Six weeks old: It's getting harder and harder to keep them contained and their living accommodations are growing along with them. 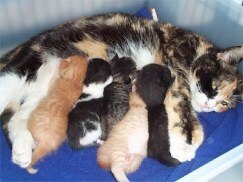 Mommy Mona is able to come and go as she pleases but we have to keep the kittens confined because they get into the darndest hiding places making Mommy Mona cry for them and foster mom crawl around on her stomach with a flashlight!